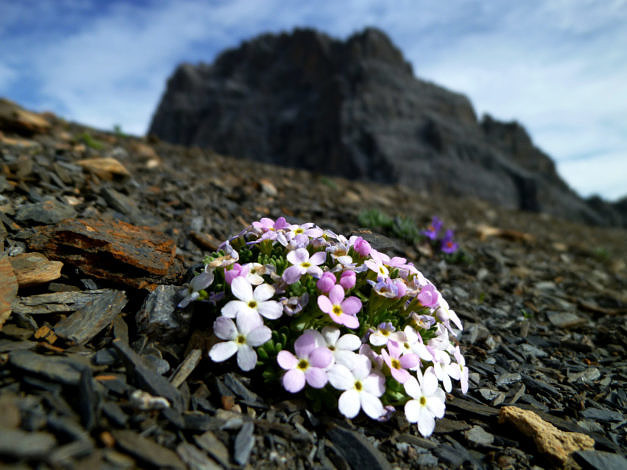 Significantly more species of plants are growing on mountain summits than 100 years ago. Several studies have already indicated that this is due to global warming. However, up to now, no direct link had been found between an increase in temperature and an increase in the number of plant species on a large scale. A team of researchers led by Prof. Dr. Manuel Steinbauer from the Professorship for System Paleobiology at Friedrich-Alexander-Universität Erlangen-Nürnberg (FAU) and Dr. Sonja Wipf from the WSL Institute for Snow and Avalanche Research (SLF) and scientists from 11 countries have now successfully proven for the first time that the diversity of species on mountain summits in Europe is increasing and at an ever faster rate. The results have now been published in the renowned journal Nature (DOI: 10.1038/s41586-018-0005-6). The researchers examined the vegetation on mountain summits across Europe and investigated three possible influencing factors: changes in temperature in the summer, the change in annual rainfall and nitrogen deposits. In all, they surveyed populations of plant species on 302 summits in the Alps, the Pyrenees, the Carpathian mountains and on mountains in Scotland and Scandinavia. They then compared their findings with older, and in some cases, historical records of vegetation on the same peaks. This provided a unique set of data spanning a period of 145 years. ‘More and more species are able to push up from lower elevations into regions at higher altitudes, where they were unable to survive a few decades ago. There are clear indications that this is due to global warming’, explains FAU palaeobiologist Steinbauer. These species are larger on average and are therefore more competitive than traditional summit species. These traditional species are at risk of being forced out in the long term. However, it will be decades before we know how climate change has changed species composition on mountain summits in the long term. The results show that the number of species on European peaks has increased in general. In addition, this increase has been happening at an ever faster rate during the last few decades. The increase in species diversity is five times higher in this decade than in the decade 50 years ago. This is due to climate change, which is also occurring at a faster rate than before. The higher the temperature increased in the time period between two vegetation records on one summit, the higher the increase in the number of plant species. ‘This is the first time that such an accelerated reaction to climate change has been demonstrated in alpine habitats,’ says SLF researcher Sonja Wipf. Up to now, such accelerated processes caused by ever faster global warming had been demonstrated primarily in inanimate systems such as glaciers.